I have done some German in the past (including an Open University Level 1 Module) but not for a few years. Do I need to start with Coffee Break German 1 or could I jumped straight into Season 2? We suggest that you have a listen to some of the lessons towards the end of Season 1. You can access the free audio lessons here: http://radiolingua.com/tag/cbg-season-1/. If you find that these are still challenging for you, you can access the full course on the Coffee Break Academy here. I have just finished Coffee Break German episode 39 and was feeling a bit sad that tomorrow will be the last show. So I was delighted to log onto the website and learn there is a season 2! Our Head Office is in Berlin so I am there every 3 months. Although I do not need German for my job I feel it is an excellent opportunity to lean and use a language. Coffee Break German has helped me book hotel rooms, order meals, make small talk, give directions, get taxis and most importantly given me confidence to speak the language. So as soon as it is available I am signing up for the paid version of season 2 because I love the video flashcards! Superb work on Season 1, and the podcasts are a great way to train the brain while commuting. One question though, what happened to the Genitive case? Are you planning on introducing it in this season, or is it going to stay like that awkward relative the family don’t discuss? We’ll be covering the genitive in season 2! So glad to see season 2, season 1 was fantastic!! I recommend Radio Lingua any time I have the opportunity. Why isn’t it possible to download mp3 files of coffee break German season 2? You can download the free episodes of Season 2 from any podcast app by subscribing to the podcast. Hope this helps. Hi Mark, may I ask which level it covers in CBG Season 2？Like A2 or something? Thanks! 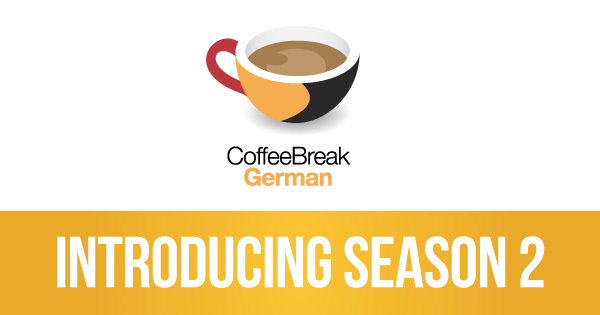 I love the first season of Coffee Break German, it’s just wonderful! In Season 2 we work between A2 and B1. Of course, like all self-access courses, we’re focusing on receptive skills, so while you’ll be able to understand B1 level written and spoken texts you may not necessarily be producing B1 level language. We would suggest that you combine Coffee Break German with other resources and opportunities to speak and write in German. Hope that helps.